Four parts in grey resin. A very quick way to preparea set of drop tanks for the Hien; very nicely cast. This is a simple and nicely cast set of tanks for modellers wanting to replace the kit components and build a long-range version of the fighter. This is a useful add-on for the Tamiya or any other manufacturer’s kit. 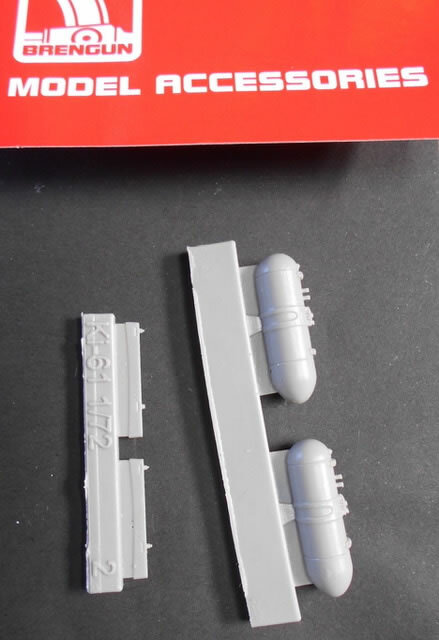 It consists of four mid grey resin parts, the two wing pylons and two nicely detailed tanks which feature well-cast bands and connectors. The modeller merely seperates the components by slicing through the thin casting webs, a quick clean-up and Bob’s-your-uncle! There are no instructions or painting details, so I guess they merely replace the kit components. Thanks to Brengun for the review samples.